I first met Virak Roeun three years ago on a New Khmer Architecture* tour of Phnom Penh. Virak was the tour guide, and his passion for architecture immediately made him stand out. Not only was he extremely knowledgeable and well versed, he also spoke with acute confidence, eloquence, and infectious zeal about iconic buildings designed by the late Vann Molyvann**. While the Olympic Stadium and the Institute of Foreign Languages always intrigued me, Virak brought them to life on the tour. Khmer Architecture Tours are an independent, not-for-profit organisation operated by Space for Architecture Cambodia with the goal to promote dialogue on urban design as part of Cambodia’s cultural heritage. The tours primarily focus on buildings erected after Cambodia’s independence in 1953, while setting these in the historical context of Phnom Penh. Virak is not only a tour guide, he is also an architect himself, and a graduate of the Royal University of Fine Arts. At 27 years old, he is personable, self-assured, and incredibly enthusiastic about his chosen field. He knew from a young age that he was interested in buildings and how people live in big cities. Now, with the belief that everyone deserves and benefits from good design, no matter their income level, Virak hopes to make a positive impact on the development of living and working environments in Cambodia. Virak, Have you always lived in Phnom Penh, and when did you start giving New Khmer Architecture tours? I was born here, but in 2004 my family moved to Battambang. I came back in 2009 to go to university. In my third year a fellow student introduced me to the Khmer Architecture Tours. There was a tour about New Khmer Architecture (NKA), and I was very enthusiastic about architecture from the 1950s-1970s. I was a trainee guide for about a year, then became an official tour guide in 2012 or 2013. I have learnt so much about NKA from the tours, and I’m very passionate about it and raising awareness about urban heritage buildings in Phnom Penh. I love that most of the modernist buildings of NKA have shown an obvious connection to Cambodian cultural heritage, such as ancient Angkorian features. Another rewarding aspect of the tours is the many interesting people from all over the world I have the pleasure of meeting and making connections with! The late Vann Molyvann was a pioneer of the NKA movement. I learned much about him from you! What did he and his work mean to you? Vann Molyvann's work is a significant piece of Cambodian heritage and is very important to me. He was so talented… he cleverly combined design philosophies of Le Corbusier with Cambodian lifestyle factors and cultural influences to create buildings that were so unique. I personally don’t think anyone here has designed anything quite as impactful and meaningful since Vann Molyvann… But I remain hopeful for the future of Cambodian architecture! The library at the Institute of Foreign Languages, designed by Molyann. Olympic Stadium, designed by Molyann. Photo by Virgile Simon Bertrand. When did you first develop an interest in architecture? How did this turn into a vocation? Since I was very young I was very interested in drawing things, especially buildings. I loved drawing cities. I remember when I was in eighth grade, I took a geography textbook from my school’s library because I was obsessed with a picture of Singapore city on the very last page... but I remember having mixed feelings about it. At home, I drew the buildings in the picture, but I re-arranged them to make them more proportionally pleasing to me! You must have been very good at drawing! Yes, I was able to draw to scale from a young age too. Once, as a boy, I drew a fantasy map of Koh Rong Sanloem as if it were a city. I drew in metro systems, the infrastructure and administrative border from district to district… I imagined what the island would be like if it were like Singapore one day. I always shared my interest with my parents, and later convinced them to let me study architecture in Phnom Penh. We were a low-income family, so money for school fees was a big ask, but they let me go to architecture school anyway! I am very blessed. Singapore has a lot of skyscrapers. As high-rise buildings increasingly occupy the Phnom Penh skyline… What are your thoughts on them? I liked high-rises when I was little, but now, especially since becoming an architect, I’ve changed my mind - I don’t like them at all. To me, they are not a necessary element to a comfortable city lifestyle. I think the architecture scene in Cambodia will take some time to reach the creative level it was at before the Khmer Rouge. Having said that, I think there are some very good architecture firms here making great work, like Martin Aerne, Asma Architects, Re-Edge and Hok Kang Architects... Overall, I believe Phnom Penh design is on the right path. Sketches from Virak's designs for a university project to revamp the National Sport Complex campus. 3D rendering of Virak's designs for a university project to revamp the National Sport Complex campus. 3D rendering of Virak's work for a university project to design a local and international artists. Lastly Virak, what are your personal goals as an architect? I believe great design should be available to everyone, and I’d like to be able to deliver that. Everyone deserves it and benefits from it - including low-income communities and those in more rural areas. I came from a low-income family, and ultimately I would like to contribute to communities like the one I grew up in. Currently, I am working on freelance projects as well as volunteering for an Australian NGO, RAW Impact Cambodia, on their plans for sustainable housing in local villages. Sustainable housing by RAW Impact. * New Khmer Architecture was an innovative Cambodian architectural movement that took place in the 1950s and 1960s. It combined elements of Modernist architecture with the those of ancient Angkorian structures, and traditional designs of local housing. **Vann Molyvann is arguably the most well-known New Khmer Architect. He recently passed away on September 28th, 2017. 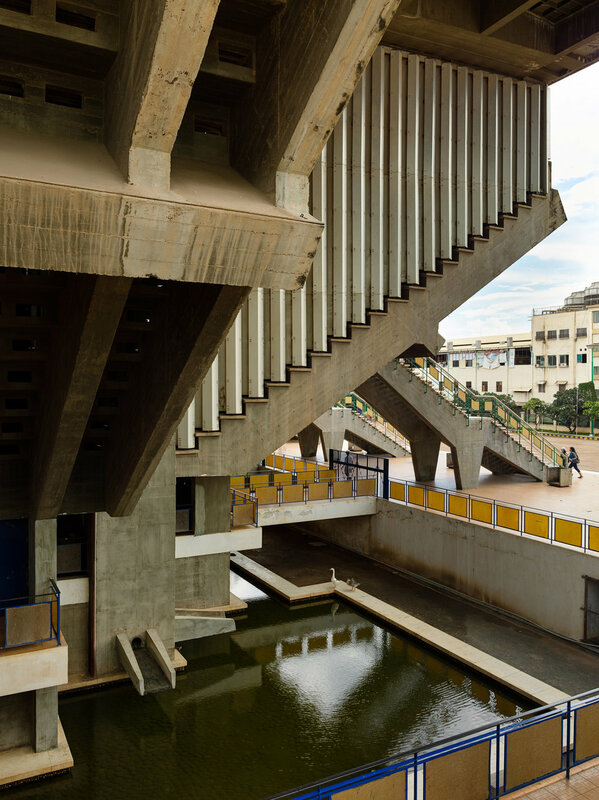 As state architect, appointed by Prince Norodom Sihanouk, Molyvann designed many of Cambodia’s most iconic public buildings. For his extensive contribution to the development of Phnom Penh, and to the cultural identity of Cambodia post-Independence, Molyvann came to be nationally revered, and referred to as ‘the man who built Cambodia'. Dec 29 Everyday Cambodia, In A Bookh.